The “bookends of King David’s life in the Books of Chronicles are the two great events that the shape the worship life of ancient Israel. The first is the installation of the Ark of the Covenant in Jerusalem (1 Chron 15-16). The second is the preparation for the building of the God’s temple in Jerusalem (1 Chron 28-29). Both accounts conclude with doxology and contribute purposefully to the recurrent themes of Chronicles as “biography of God,” a “theology of hope,” a “call to worship,” and “joy.” Not surprisingly, all four remain timely topics for consideration by the Christian church. This installment will focus on “a call to worship” as understood in David’s prayer of thanksgiving as kingship in Israel transitions to his son and successor, King Solomon (1 Chron 29:10-20). All three sections of David’s prayer in 1 Chron 29:10-20 work together to form a call to worship God. The first unit is a doxology or hymn offering praise to God for his greatness and faithful ness (vv. 10-12). The second section (vv. 13-16) is a song of thanksgiving that concludes with a confession of YHWH’s graciousness and goodness. The third frame (vv. 17-19) is a supplication with a petition for the people of Israel to remain loyal to the God of Israel. David’s praise-prayer closes with the king’s invitation to the “whole assemble” to praise God (v. 20). One senses that the Chronicler is issuing the same invitation to his audience through the declaration of David. The narrative preserving the second anointing of Solomon (1 Chron 29:21-25) climaxes with “all Israel” celebrating in the presence of the LORD. Surely, the Chronicler envisioned a similar experience for the people of postexilic Judah. Even the eulogy of King David (1 Chron 29:26-30) stands as an indirect call to worship, since the king’s long life, wealth, and honor are understood as gifts from God (cf. Prov 22:4). This call to worship supports the observation that the books of Chronicles may be broadly understood as a commentary on Psalm 84:4: “Blessed are those who dwell in your house; they are ever praising you.”¹ In a way, the Chronicler is inviting his audience, all postexilic Judah, to share in the joy experienced daily by the priests and Levites in their service of worship to the LORD in the Jerusalem temple. In a real sense, King David lays the foundation for participatory corporate worship in ancient Israel and later Judaism in two respects. First, the geographical location of Israel’s worship space is secured in David’s purchase of the property for a temple site (2 Sam 24:18-25; 1 Chron 21:18-26). He ensured the success of this work in is preparations for building the temple as a replacement for God’s portable sanctuary, including securing the raw materials necessary for construction (1 Chron 29). The development of a permanent site for corporate worship localizes the notion of “sacred place” for the Hebrews. Second, David reestablished the elemental spiritual principle of Hebrew worship when he prayed that an obedient heart might characterize the people and his son Solomon (1 Chron 29:18-19). Here David essentially echoes the sermon of Moses that called for unqualified obedience to God’s decrees because he alone is Israel’s praise (Deut 10:12-13, 21). Liturgically, the call to worship is an invitation, a summons to the assembly of the faithful into God’s presence. 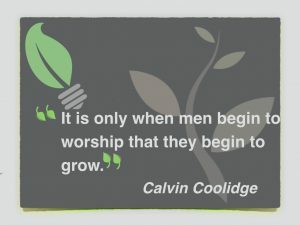 The call to worship bids the Christian worshiper to join a celebration, praising God for who he is as the only true and Triune God; and thanking him for what he has done and will do to restore his creation and redeem humanity made in his image. The Chronicler’s message is largely “borrowed” from the writings of earlier historians, prophets, and kings who spoke and recorded “the word of the LORD.” The Chronicler truly believed that the word of the LORD stands forever (Isa 40:8). The writer of Chronicles assumed the words of God once spoken and preserved command equal authority when “preached” to a later generation of God’s people. For that reason, his call to worship the God of Israel, the same LORD of Christ’s church, will never grow stale or go out of style. ¹ So Leslie C. Allen,” hll,” in the New International Dictionary of Old Testament Theology and Exegesis, 1:1037. ² See further, Leslie C. Allen, 1, 2 Chronicles. Communicator’s Commentary 10. Waco, Tex,: Word, 1987.